The water shows me sky. Daman, is anything but “dry”! These words succinctly express what I felt after my three-day trip to Daman last year. Daman arguably has a reputation of being a liquor-haven for people craving for booze in the adjacent dry-state of Gujarat. But there is more to this union territory than cheap alcohol. I could find that out because I wasn’t looking to get “high”. I was on a mission to unearth the natural secrets of Daman! It was fairly easy for me to plan the weekend getaway as there are conveniently timed and frequent trains that run between Mumbai and Vapi. Vapi is the closest railway station to Daman. Once you alight at Vapi, you can either take the stairs that lead to Daman, or go the other way and reach Silvassa. After a three hour train ride, I caught an auto-rickshaw to my hotel in Nani Daman. It barely took me twenty minutes to get from one city to another! That is unimaginable in big, crowded cities. I stayed at Hotel Blue Lagoon which is a centrally located business hotel and has good rooms at affordable rates. After a filling meal of assorted stuffed rotis and curry, I set off to explore the city on foot. Daman does not have any indigenous cuisine to call its own. However, seafood and regular Punjabi and South Indian dishes are widely available at most restaurants. I walked for about forty minutes through almost empty streets and pathways lined by palm trees, before I saw the blazing sun on the horizon. I knew I had reached the pristine Devka Beach. Devka is free of tourists, and an ideal place for some soul searching and quiet self reflection. I sat on the black sand and listened to the soft waves as they kissed my toes and “sizzled” back to the depths of the Arabian Sea. I say “sizzled” because the waters leave a bubbling froth when they retreat. This is because the earth here is slightly acidic. That is also the reason why swimming or taking a dip in the sea is not advisable in Daman. The water can be harsh for the skin. On my way back to my hotel, I bought some vodka and breezer to acknowledge Daman’s significance in a liquor-free state. Over a couple of drinks, I mused how peaceful this city actually is. Devoid of any nightlife, the residents of this place presumably sleep well. Despite being labelled the “Goa of Gujarat”, Daman has neither the crowds, nor the frolicsome atmosphere. The locals prefer to dress modestly even when they are lazing by the beach. The next morning, I started for St. Jerome’s Fort which is also known as the Fort of Nani Daman. Daman comprises two areas – Moti (Big) Daman and Nani (Little) Daman, separated by the Daman Ganga River. The monikers are misnomers though! Nani Daman is actually the larger of the two! The fort is an old stone-built complex which houses a church. The upper decks of the fort afford copious views of the lovely Daman port that has many boats moored, perhaps belonging to the fishermen. 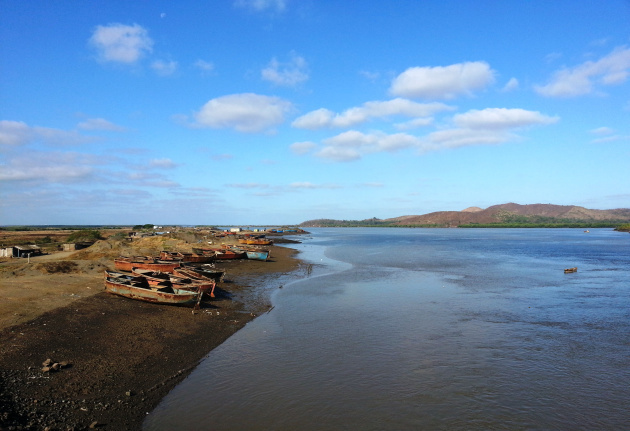 Those boats, unfortunately, do not ply across the backwater to Moti Daman. There are two bridges that connect the two lands though, and only one of those is motorable. Moti Daman has its own share of surprises. It houses the administrative district of this union territory and is much neater and better organized than Nani Daman. The Fort of Moti Daman and the Lighthouse take up almost two hours to explore. This area also has canons from the yesteryears. Even though Daman was under the Portuguese rule for several years, the Portuguese influence is limited to the architecture of the forts and churches. The Indian people have not thought it important to preserve their food, dressing or language after independence. I spent my remaining time in the city visiting various ornate churches – Our Lady of Rosary Church and The Lady of Remedious Church, to name a few. The churches are small but beautifully adorned in golden-bordered statues and murals. I saw also the ruins of the Dominican Monastery, but there’s hardly any building left of it to appreciate. I couldn’t help but notice a lot of lavishly erected bungalows by the sea. These houses, I was told, belong to wealthy Gujarati businessmen who earn in Gujarat and celebrate in Daman. The lax liquor-laws and empty beaches make Daman an ideal party-place and cheap location for holiday homes. My final stop was Jampore Beach. Now, this was one crowded and slightly dirty beach with several makeshift shacks that lined the entire stretch and did brisk business selling beer and pakodas. One can try paragliding or camel or horse riding on this beach. As the day wore on, I sat once again, this time on a lounger, to watch the golden sun dissolve into the black waters. In hindsight, I was glad to have made the trip. It was easy to plan and quite light on the pocket. I beat the tourist rush by visiting in the off-season. Daman fortunately enjoys a pleasant subtropical climate with temperatures always hovering between 20 and 30 degrees Celsius. You only need to pack a pair of flip-flops and shorts for your Daman-weekend. And don’t forget to carry along walking shoes if you love to explore places on foot! The port of Daman awaits you. So, when are you planning to visit this tiny union territory? Have you been to a similar place before? Tell me your stories in the comments below! This entry has been shortlisted for Holidify’s Travelogue Writing Contest in association with Linger. The content and pictures may not be used without prior permission of the author. Nightlife of Daman - Hub of Activities That You Cannot Miss! Shopping In Daman - For The Shopaholic In You!